I don’t recall eating Hamburger Helper much growing up. Though it’s possible I’ve just been blocking the memories out all of these years. I did make a good run with HH, and its sibling, Tuna Helper, my senior year of college though. At least, when I wasn’t mixing frozen vegetables with ramen and calling it a balanced meal. You know, #adulting. Anyway, my point is, there is definitely something to a big pan of cheesy, meaty, saucy pasta for dinner. Especially if you add bacon and creamy american cheese [save your snickering, I’m an avowed american cheese fan]. This meal takes a bit more time to pull together than the boxed version, but I’m telling you it will be loads better. Like, tons and tons better. 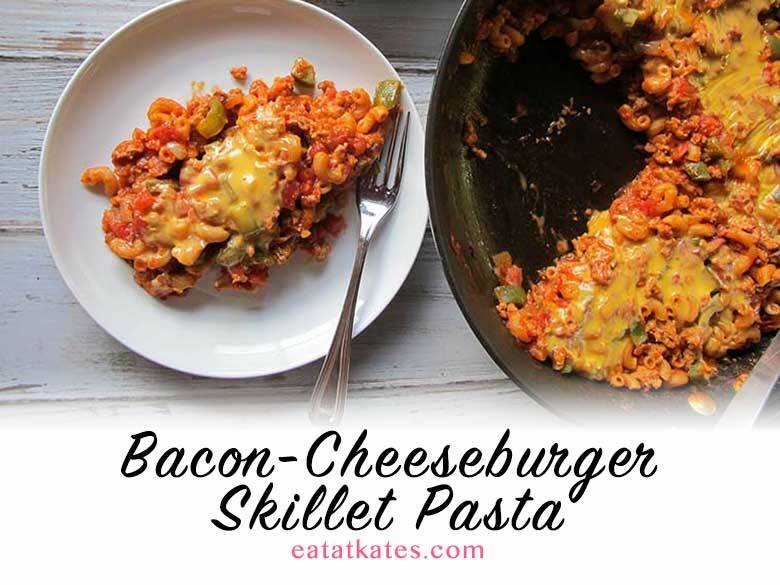 No “helper”, not even a pot of boiling water, is needed for this tasty skillet pasta. 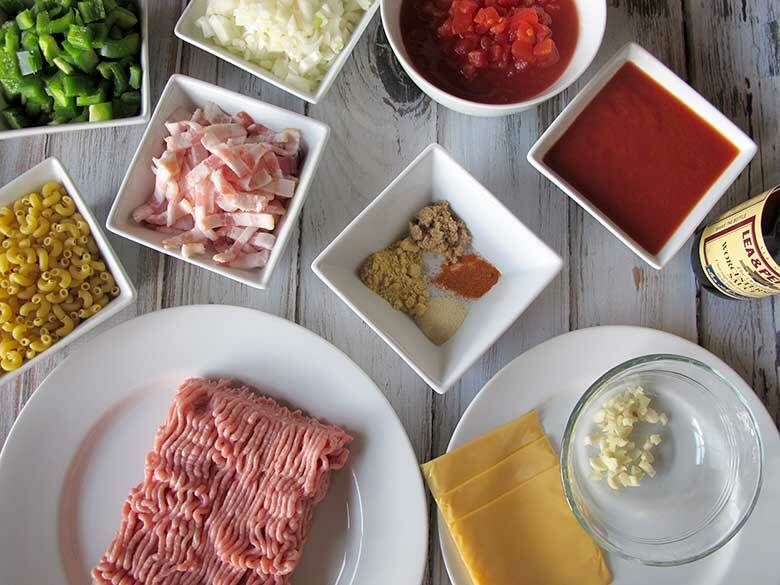 Ground turkey, bacon, tomato, seasonings, and melty american cheese come together for a delicious weeknight meal. 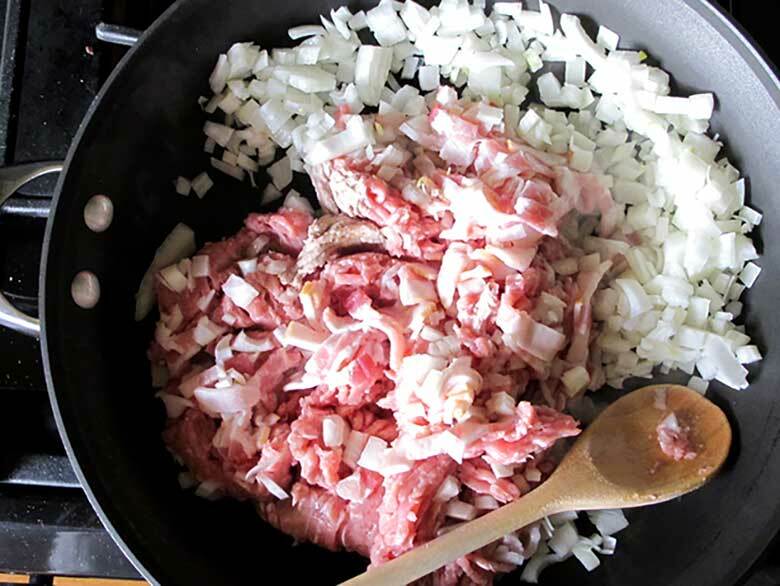 In the skillet, cook meat, bacon, and onion together over medium-high heat until meat is just cooked through. Return pan to heat and add tomato sauce, diced tomatoes, garlic, and seasonings; bring to simmer. 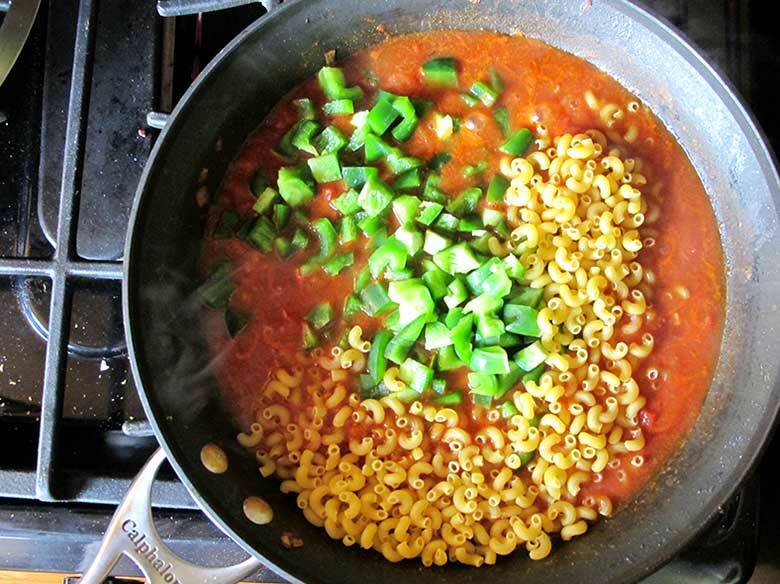 Mix in pasta and green pepper and season with salt and pepper. Cover and simmer for about five minutes. Return meat mixture to pan and mix together. Simmer, covered, for additional five minutes until pasta is cooked through. 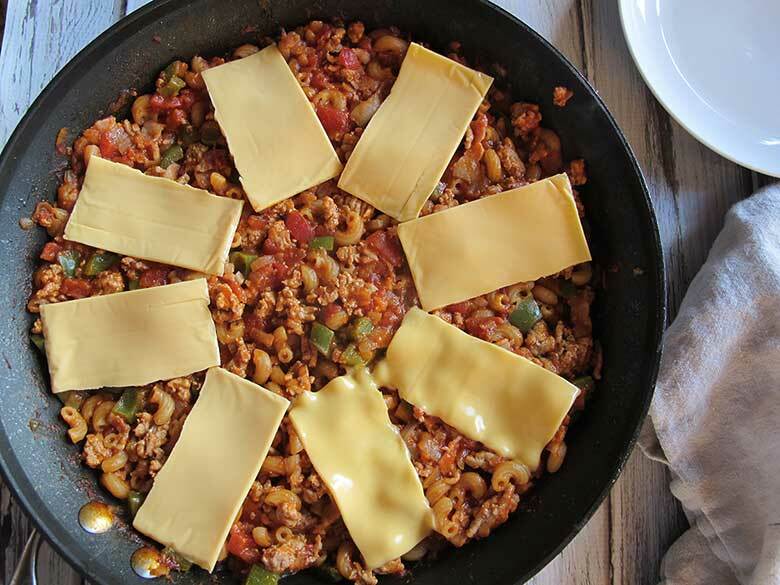 Top with cheese slices and cover. Let sit for a few minutes, until the cheese melts, then serve. 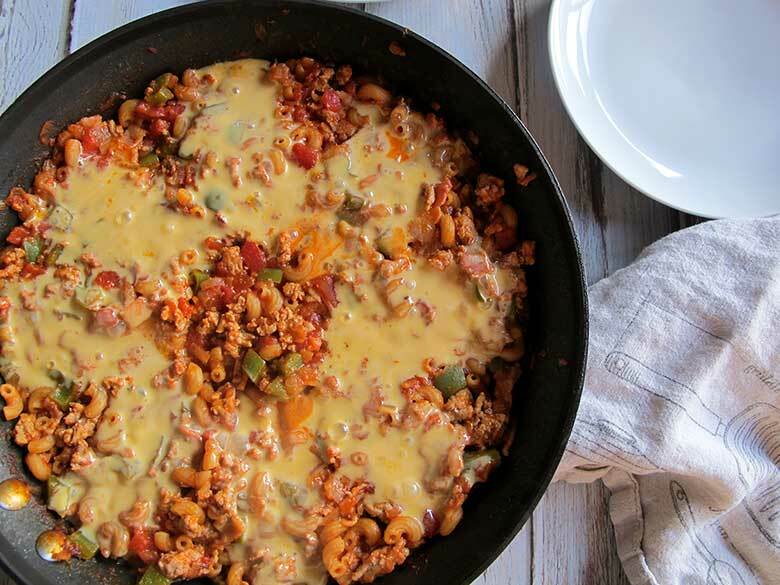 Track it using MyFitnessPal (based on 93% ground turkey). Elbow pasta is ideal because its small size and shape allow it to cook quickly. If you’d like to use another pasta shape, you will need to adjust the cooking time accordingly; Longer for larger pastas like penne and shorter for smaller pastas like orzo. It will also affect how “saucy” the final dish will be. I like adding the green pepper with the pasta so it retains a bit of its texture, but if you prefer for it disappear more, then cook it up with the turkey, bacon, & onion. So glad everyone enjoyed it! And, yes, the pasta does soak up some of the liquid while cooking, so if you don’t have all of the tomatoes/sauce, then the pasta should be cooked separately or you could add some water/broth to the pan.